The first Fabergé egg was crafted for Tsar Alexander III, as a gift for his wife, the Empress Maria Fedorovna. Maria was so thrilled by the gift that Alexander appointed Fabergé as "goldsmith by special appointment to the Imperial Crown" and commissioned another egg the next year. Imperial eggs were made every year since, until the 1950’s, except in 1904 and 1905 during the Russo-Japanese war. Of the 65 known Fabergé eggs, 57 have survived to the present day. The eggs were each completely unique and made from an array of materials, from three-colored gold to rock crystal, and always beset with precious stones and gems, like emeralds, pearls, and diamonds. They range in size, from under three inches to over five inches tall, and could often, but not always, be opened to reveal a surprise. 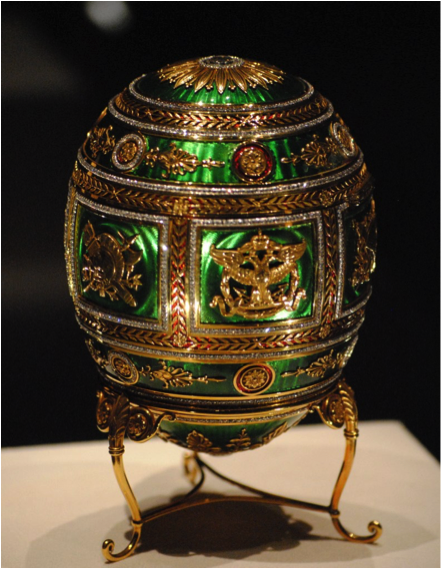 Everyone knows about the famous eggs but Fabergé also makes time pieces, jewelry, and many other interesting creations. For more information on the eggs and rare pieces check out these links.